Did you ever forget that Kim Kardashian dyed her hair blonde before Paris Fashion Week last year? Yeah, me neither. Did you care when Kim Kardashian dyed her hair blond for Yeezy Season 3 last month? Yeah, me neither. The tireless continuity of the headline-warranting Kardashian family has permeating the fashion sphere in the past two or so years. I’m not that bothered by it, to be perfectly honest. It exposes our unabashed palate for celebrity culture in the Instagrammic age, and the fashion industry’s commercialisation of that. So why the talk of hair colour? At the Balmain show on Thursday, Kardashian’s half-sister Kendall Jenner opened the show sporting a grey-blonde wig. Then came Gigi Hadid in a brunette wig, Lineisy Montero with flowing locks, Lily Donaldson with black, Devon Windsor in ombre brunette and Rosie Huntington-Whiteley with black. Throwing audiences with the wigs, I began to think: was it another pitiful attempt at the social media moment, or an effort muddle the audience into thinking there is a lack of the above models? Sadly, I think it is the latter. Lately, Olivier Rousteing’s tiresome streak at the house was getting a bit too much. I constantly crave the grittiness and realness of Christophe Decarnin. Realness is a dangerous word when discussing Rousteing. The controversial term “real women” simply cannot apply here. Heavily corseted dresses and cinched waists looked painful (one model sustained an injury, as seen on Snapchat). A number of pre-fall looks dispersed at the men’s show displayed how challenging these clothes are. Stomping males halted behind the female models who walked painstakingly slow down the catwalk. 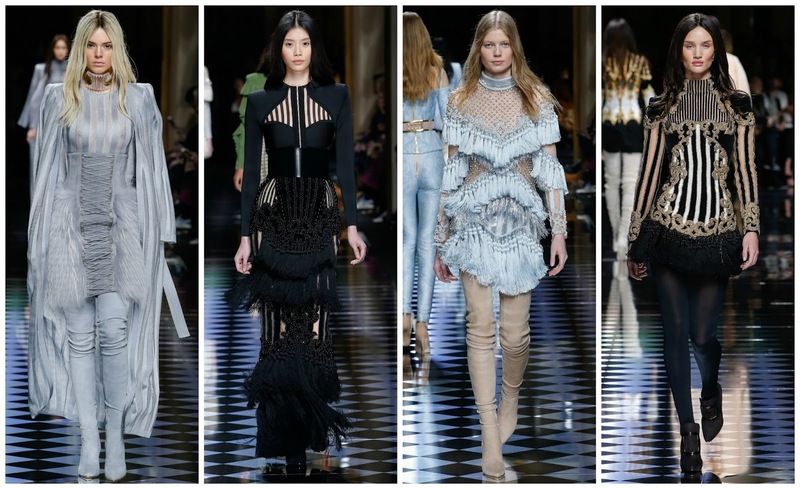 The Glamazonian lineup certainly sells the Balmain dream, but it’s highly unattainable. Honing his focus in on the more grandiose side of the label, Rousteing convincingly creates splendorous, 19th-century-infused modern glam. In pastel blue and pink, and starker black and whites, the designs with excessive amounts of beading, fringing, embellishment and embroidery paraded the runway with standoffish success. Corsetry and hourglass-creating, the mini dresses, evening gowns and two-pieces. Rousteing’s Balmain look for Fall featured the lasting influence of the aforementioned Kim Kardashian. The shapes and the muted colour had the reality star written all over them. Rousteing didn’t deny, Kanye confirmed. Leandra Medine’s review of the collection turned into something existential—asking “where’s the purpose?” It is a great question to ask. What is the purpose of something like Balmain that serves the .000001%. We don’t need to discuss price range, which is astronomically high. The clothes: glitz, glam and needing a whole lot of chutzpah to wear. Most of his collections look undeniably beautiful. This one was more standoffish. The grandeur was too much and it did ignite the thought process—as Leandra said— of “why are we here?” It’s probably the name attached to the clothes and the social media army behind the house. Reassessing focus will probably be difficult, but I hope someone gives this label a reality check by next season.